The joint activity was a good opportunity, for young croatian pilots, to increase the knowledge, experience and self-confidence. Three Dassault Alphajet aircraft of the French Air Force ended March 2 their two-day visit to the Fixed-wing Squadron of the 93rd Air Base of the Croatian Air Force and Air Defence in the Barracks “Pukovnik Mirko Vukušić“ in Zemunik. 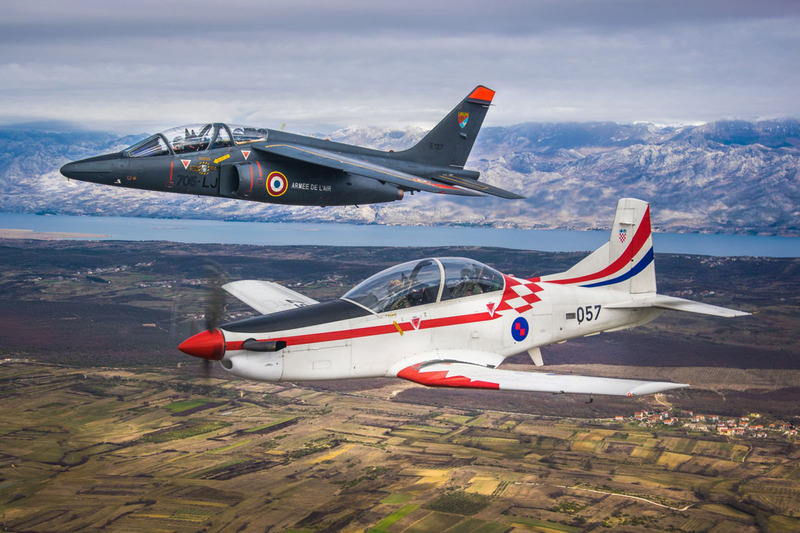 It was the first visit of a French military aircraft to Croatia, paving the way for reinforced co-operation in pilot training. The activity was organised within the programme of practice, planning and conduct of international overflights to foreign airports and the respective procedures, which is a routine training procedure for French military pilots. The pilots of the Fixed-wing Squadronof the 93rd Air Base and the French pilots performed a joint training in group flying in their Pilatus PC-9M aircraft, while the pilots of the Fixed-wing Squadron of the 91st Air Base practiced air interception and target identification flying their MiG-21 fighter aircraft. The Deputy Commander of the Fixed-wing Squadron and Aerobatic Group “Wings of Storm“ Team Leader, Lt. Col. Damir Barišić, appreciated the opportunity to host the pilots of the French Air Force and exchange the experiences related to the education of military pilots. "The training activities of the kind are a common practice in most European air forces and a valuable opportunity for young pilots to increase the knowledge, experience and self-confidence."